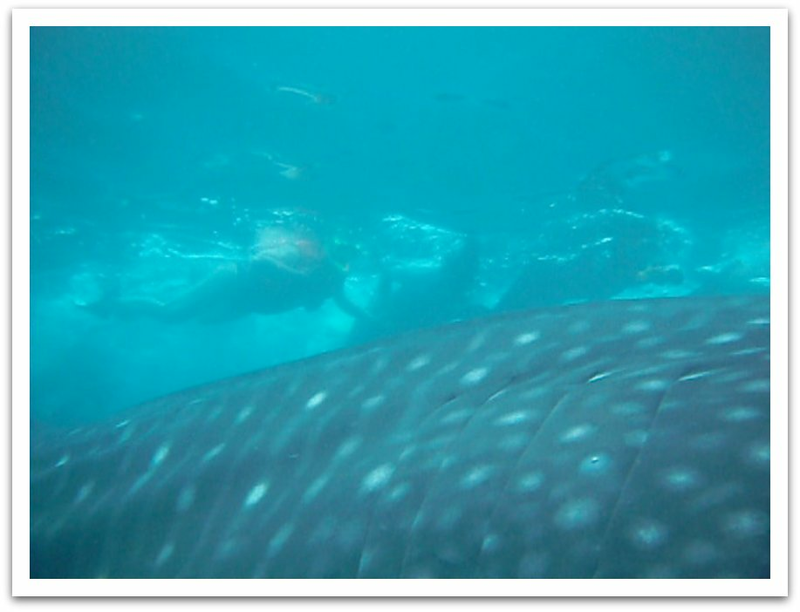 The 30 Before 30 Project: #2: Swim with whale sharks in Donsol—CHECK! For diving enthusiasts, there's something called "The Big 3"—the most impressive of the underwater world's creatures that one strives to see in a lifetime. The big three consists of manta rays, hammerhead sharks and whale sharks. On April 20, 2011, I came face to face with one of the marine world's kings, the whale shark, and found out for myself why this encounter is one to seek out in this lifetime. 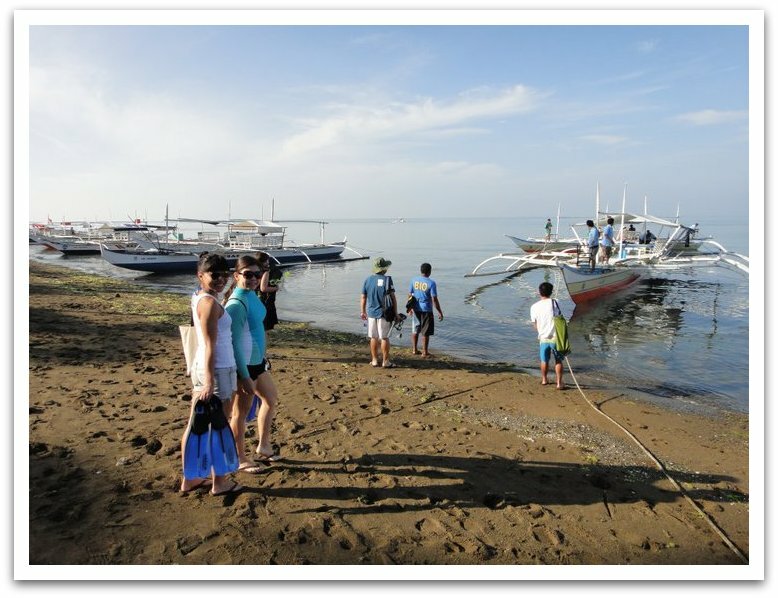 Donsol was once a sleepy fishing town in the province of Sorsogon. Its fishermen found these massive underwater creatures they called butanding a constant source of annoyance as they would constantly get entangled in their fishing nets. It wasn't until a passionate diver shot footage of these extraordinary whale sharks and brought it to the attention of the World Wildlife Fund that the people of Donsol realized what treasure was swimming underneath their waters. 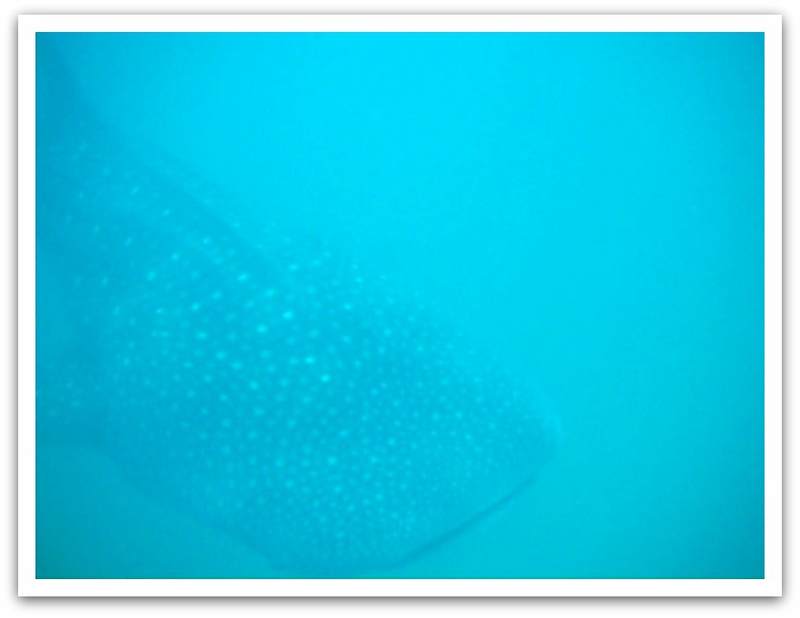 These whale sharks, the largest living fish species at up to 12 meters (41.5 feet) in length, are known to come to Donsol to feed on its plankton rich waters, but recent studies have suggested that this may be a birthing spot for the gentle giants, as well. Today, Donsol is widely recognized as the "whale shark capital of the world" and was featured as the Best Animal Encounter in Asia by TIME magazine in 2004. From my experience, this title is truly well-deserved. Our journey began with a flight from Manila to Legazpi City—a place with its own set of must-see sights (watch out for a separate post on Legazpi). My friend Magic arranged our accommodations and tours with Donsol Eco Tours. For P4,965 per person (approximately $116), we were set up with a two-night stay with breakfast included at Woodland Resort, roundtrip transfers from the airport to the resort, whale watching with lunch and gear rental (fins and snorkels) included, and an evening of firefly watching. After watching the video we were off. We were blessed with bright blue skies and the calmest waters I've ever seen. The sky was so clear that we could see the tip of Mayon volcano from the sea. It was a beautiful day to make friends with some whale sharks. I ended up crashing Mag's family vacation but it was lots of fun. I've known her since we were in elementary school and her husband Andy since we were in high school. Her parents are the coolest folks ever—as evidenced by how willing they were to join us in chasing down whale sharks. Our party of five was just the right size as each boat can carry six swimmers max. Apart from our group and our guide Christopher, we also had a butanding interaction officer (B.I.O.) named Florante, a boat driver, another crew member and a spotter. The spotter stays in this position for most of the ride to find those whale sharks. We had a pretty good crew because it didn't seem too long before our spotter jumped down from his perch and told the boat driver to turn of the propeller. He had spotted a whale shark! 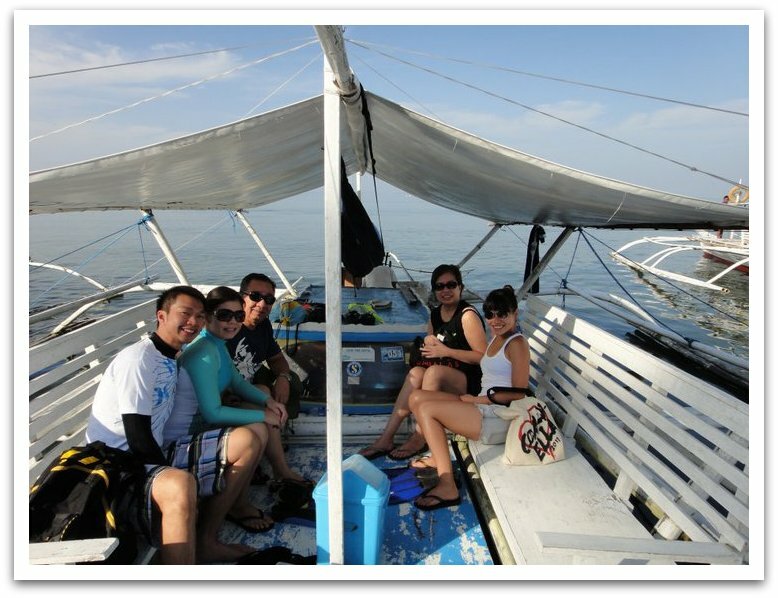 We quickly pulled on our snorkels and flippers, and perched on the sides of the boat to wait for Florante's go signal. At his signal, we jumped into the water and searched the cloudy aquamarine waters for a sign of the whale shark. Nothing quite prepares you for your first encounter with a whale shark. One minute, you're looking into empty waters. The next, there's a massive whale shark swimming right in your direction. My mind seemed to go blank at that moment. The only thought I could conjure up was, "Swim." I somehow ended up swimming right above the whale shark. It was breathtaking to be able to see those distinctive spots and its gracefully swaying fin and tail just meters away. Most mind-blowing of all was the mere fact that this majestic creature was just gently moving along, allowing us little humans to join him for a swim. This video taken by Andy captures the experience of swimming with whale sharks perfectly. This is exactly what it's like: you jump in, peek into those turquoise blue waters and most likely see nothing, goof off for a little bit, and then BAM! Suddenly a whale shark is coming at you and you swim as fast as your fins can take you. Isn't that just amazing? My camera pretty much croaked after this but it was worth every dollar for the videos Florante took. Here's a tip for anyone considering bringing an underwater camera for this adventure: Get one that works for more than 10 feet if you plan on handing it over to your B.I.O. at any point because those guys can swim and stay underwater for ridiculous amounts of time. My Fujifilm Finepix camera was not too keen on this but Andy's Sony Cybershot worked beautifully. I'm not too bothered about my camera dying on me because I wouldn't trade those amazing videos for anything. Swimming with whale sharks was an experience that's at once elating and plain old surreal. Until now, it still boggles my mind that I swam with those majestic creatures. You couldn't wipe that smile off my face for hours! It was truly one of the most phenomenal experiences of my life and one I hope that all of you will have a chance to go through at least once in your lifetime. I felt so fortunate at that moment to have the opportunity to experience something so extraordinary and I would do it all again, given the chance. The Philippines is blessed to have such treasures swimming in our waters. I am so proud of the people of Donsol for recognizing this and for being the foremost guardians of the gentle giants that call their waters home. I never knew about the big 3. I've long said that swimming with whale sharks off the coast of Cancun was one of the best adventures I've had. I'd do it again in a heartbeat and would suggest it to anyone! Your videos are incredible! What a great experience! Jessica - What an adventure, huh? I'm gonna have to read about your Cancun whale shark encounter! Cece - Glad you enjoyed it! It really was! 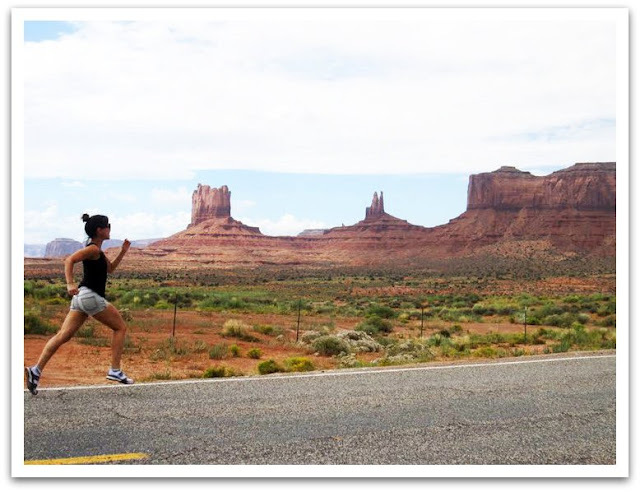 Things to Do - I can't claim credit for taking any of them, but I am lucky my companions captured the experience perfectly! cool videos!!!! can't wait to make my way to Donsol!!! prettywicked - GO GO GO!!! wow celine! what an experience! ramon went to donsol with bong a few years ago and showed me pictures, so it is definitely on the bucket list as well. :) LOVE your blog!! petit a petit - that's the word for it! kristina - you really need to go! how goes your list? Wow! Your videos are AMAZING. :D Can't wait to do this with my girl friends! Word of advice, Y: If you're planning on giving the camera to the guide so he can take videos for you, make sure it's a camera that can go deeper than 10 feet because those guys swim like fish!